250Mbps/100Mbps NBN in Canberra, launtel! 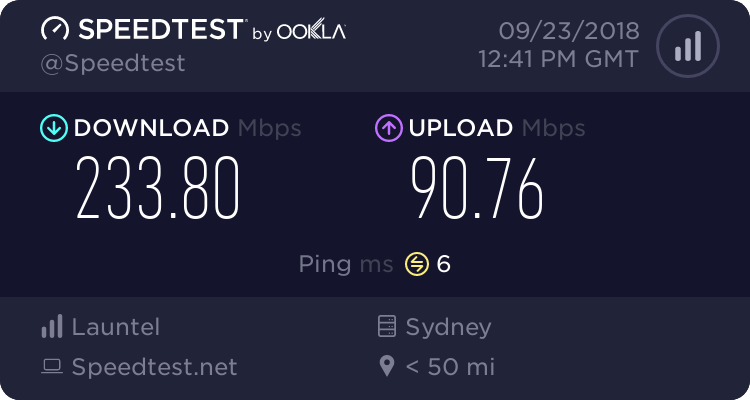 I have just moved my home internet connection over to Launtel the fastest residential NBN ISP I've seen so far at a reasonable price. Before moving to Launtel I was with Internode and to the most part I had been very happy with them, I was happy with having full IPv6 and as I was on a business account, I also had a /28 of IPv4 addresses that I uses for parts of my HomeLab but they only had speeds up to 100/40 and I felt that I could really use a high speed connection. When I put in the request to do the free trial Launtel just turn on the UNI-D 2 port and all I had to do was move my router to port two. Something that launtel do that I haven't seen before is allow users to change the speed of the connection daily if wanted, say you only really wanted 50Mbps download speeds most of the time but a new game is coming up and you want to download it as fast as passable or that you were going to have a Lan party and wanted the fastest speeds for everyone to be able to download the same game without taking hours of time. To change speed, you just logon to the residential portal. You'll see info on your service, how much Balance you have. Think of this like a per paid mobile phone. You can see how much today is going to cost and how much tomorrow is. at I'm on the 250/100 plan my cost is $4.60 per day. You can Modify or even Pause the service, say if going on a Holiday you don't have to say for the time you are away and can just turn it back on when your back home. To change your speed just click Modify, Choose the new speed you would like and in about half an hour it will change over. Congestion or speed slowdowns at peak times can be a real issue on the NBN and to the most part this is because of ISP not buying the CVC bandwidth needed for their users. Launtel happen publicly list live CVC data on their web site, this is how much bandwidth they have for the local NBN exchange (PoI) so if things seem slow you can have a look at the CVC to see if it's something on your end or there just happens to be a lot of people downloading at that time. This is something I would really like to see from some of the bigger players like iiNet or Internode. Have a look at it here! Though Launtel are still a very small ISP and at this time only have services in Canberra and Tasmanian I'm really happy to be supporting a small ISP that to me really feel like Internode back in the day. with a really love for the internet and just want to get the best service they can for their users.